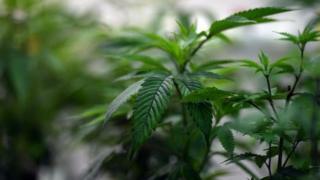 State officials in Nevada are considering emergency measures to deal with a lack of marijuana. Demand has been strong since recreational use was legalised on 1 July. There are plenty of outlets but not enough distributors, the Reno Gazette-Journal reports. Legislation gave liquor wholesalers the right to distribute, but most do not meet the licence requirements, Nevada's tax department is quoted as saying. The department issued a "statement of emergency", which means state officials could adopt emergency measures to combat the shortage. The journal quotes tax department spokeswoman Stephanie Klapstein as saying that many of Nevada's 47 marijuana stores are running out amid "reports of adult-use marijuana sales already far exceeding the industry's expectations". Nevada Dispensary Association estimated sales of $3m (£2.3m) in the first four days of legalisation, with tax revenue of $1m. Nevada voted in favour of legalising recreational use of marijuana in November, following similar moves in several other states. Medical use of marijuana is permitted in 25 states, including Nevada where it has been legal since 2001.